A short post... I needed a quick lunch/dinner tonight because hubby and I had tickets to see Oasis in concert with special guest (and my absolute fav solo artist) Ryan Adams. 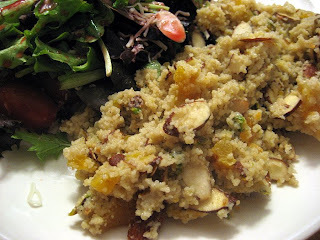 I chose this Sweet Almond Milk Couscous recipe I found in the food section of my local paper a few weeks ago. It's actually a Mark Bittman recipe, and it was delicious. As you can see, we paired it with a salad. For breakfast I made the vegan biscuits and gravy recipe from another one of my favorite cookbooks, Vegan with a Vengeance. I love this recipe... it is sooooo yummy. 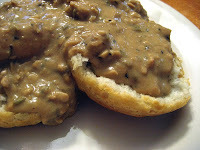 I love the bean-based gravy... it rocks! Hmmm, I actually have most of those ingredients. Looks great! Ryan Adams and Oasis...Could all those egos fit into one building?? :-) The recipe sounds delicious!